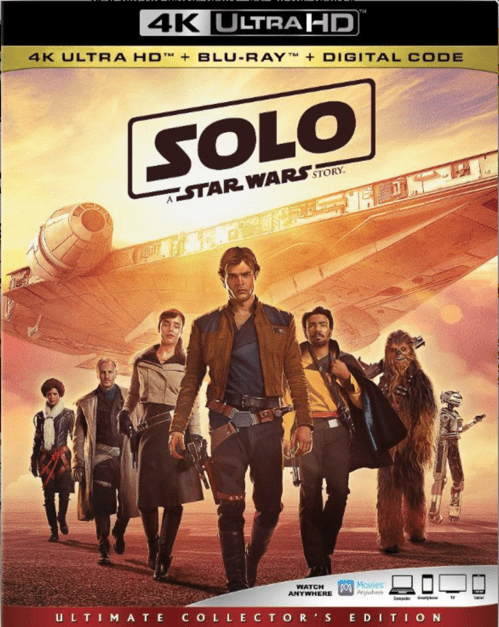 The film Solo: A Star Wars Story 4K tells about the adventures of young space daredevil Khan Solo and his faithful partner Chewbacca and how they became the fastest pilots and the most cunning smugglers of the distant Galaxy. Personally, I was skeptical: a bad cast for the main role, completely unimpressive trailers and a rather boring arch of the Skywalker era (seriously, film already the Old Republic). But the result was quite tolerable. Yes, from the film for a mile it bears mediocrity and uselessness. Yes, the main character does not have a gram of charisma Harrison Ford. Yes, dark colors prevail in the picture (which I do not very welcome). And yes, he looks more like an Outcast, than on any other film of the saga. The picture can be divided into 2 halves. In the first, all actions occur with continuous dynamics, the plot intrigues, constantly changes locations, characters and situation. The formation of Solo, the acquaintance with Chewbacca, the unexpected death of nouns and other nishtyaks, well, you understand. The second half of the film offers the viewer a straightforward story, where practically every action is predicted in advance. At some point, the narrative simply goes into the standard "arrive from point A to point B, take object B, return to point A", which does not particularly try to surprise. But the interest given by the first half, still stretches to the very end. (almost) All the actors are picked up perfectly, especially Donald Glover, turned out to be even more charismatic than his predecessor, Emilia Clark, in spite of doubts, also coped, and Woody Harrelson is quite unusual to see in such a franchise, but it fits well. But as I said Alden Ehrenrike - never Han Solo. The ending of the film loses the Outcast slightly more than completely, but for the most ardent fans prepared a meaningless and non-obligatory twist with the appearance of one of the characters of the main saga, whose appearance finally officially linked animated series on Star Wars and films. As a result, after the nightmarish heresy of the eighth episode - Khan Solo like balm per capita, but still it's time to go already in another time period, fed up with this imperial upsurge.